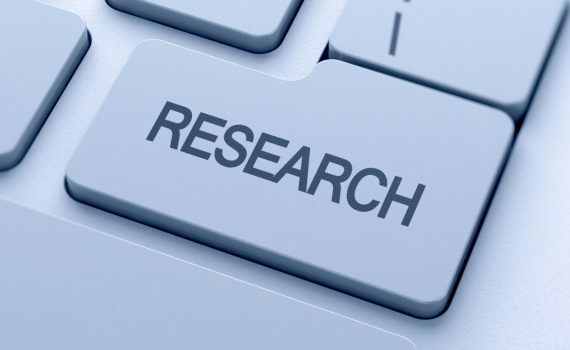 Research Opportunities For Community College Teachers (ROCCT)! Nov. 4, 2015 – In an effort to help community college teachers get their students more interested and involved in STEM-related research, a UC Irvine civil and environmental engineering professor has teamed up with the university’s Office of Access and Inclusion. 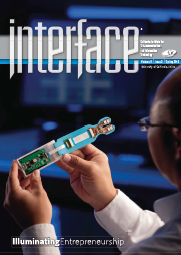 The result is ROCCT – Research Opportunities for Community College Teachers – a three-year, $600,000 National Science Foundation grant that designates UCI as a Research Experience for Teachers site, and the gathering point for participants from four local community colleges: Irvine Valley, Saddleback, Cypress and Fullerton. 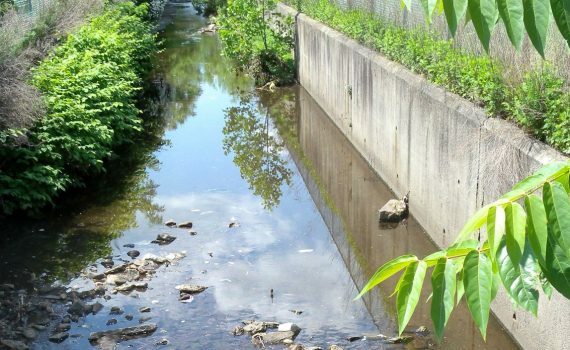 Distributed, green technologies to divert excessive stormwater flows from urban streams are common in many parts of the world, but the U.S. has been slow to adopt them. November 3, 2015—As urban areas have increased in density and sprawled outward over the past decades in the United States, the extensive conversion of green spaces into impervious surfaces, coupled with the infrastructure installed to manage stormwater flows, have created a growing problem known as urban stream syndrome. During heavy rain events, urban streams experience exceptionally high flows of contaminated water-but nearly run dry at other times. featured image A canal that once connected California reservoirs to agricultural land now lies all but dry, as do many water sources that have fallen prey to urban stream syndrome. Low-impact development and strategies for capturing and reusing stormwater can help solve the problem new research reveals. In drought-stricken California, a research team from three campuses of the University of California recently collaborated with practioners from government and colleagues at the University of Melbourne to learn more about low-impact development (LID) strategies to restore urban watersheds to a more natural balance. “Urban stream syndrome is seen in all urban areas, but the character varies based on climate,” says Stanley B. Grant, Ph.D., A.M.ASCE, a professor of civil engineering at the University of California, Irvine. “The challenge we face in Southern California is that we get a lot of runoff in a fairly short period of time in the winter. [We have] huge volumes of water hitting the ground. But with California in the grip of an extended drought, this strategy requires reconsideration. If cities can find ways to capture and reuse that stormwater, they will have created a new source of water to help offset droughts. “The problem is that we’ve developed a system that is now intrinsic to the urban fabric. Our challenge is to somehow unwind that with distributed green infrastructure—and that’s not trivial,” Grant says. The LID technologies that the team studied, already used extensively in Melbourne, include roof catchment systems that feed water into large tanks, permeable pavement and unlined biofilters that can recharge underground aquifers, and green roofs that reduce the amount of water that ultimately enters urban streams. The team recently published a critical review of LID technologies and the growing body of research on them in the journal Environmental Science & Technology. Grant is the corresponding author of the review, “From Rain Tanks to Catchments: Use of Low-Impact Development to Address Hydrologic Symptoms of Urban Stream Syndrome,” which was funded by a grant from the National Science Foundation. The team examined an environmental flow-management approach to alleviate the causes of urban stream syndrome. As cities grew, green spaces that facilitated both infiltration of water into aquifers and evapotranspiration of water into the atmosphere were replaced by pavement and hard surfaces that dramatically increased flow into urban streams. In the environmental flow-management approach, researchers determine how a watershed would have functioned in preindustrial times. They then develop a plan to take the additional water that now flows through the stormwater system and allocate it to LID interventions. The review notes that although many countries use captured stormwater for such in-home functions as toilet flushing or laundry, in most areas of the United States those types of applications are forbidden by plumbing codes or regulations. Public resistance also plays a role. Still, he points out, other areas of the world have found that public education campaigns and construction inspections have alleviated those concerns. 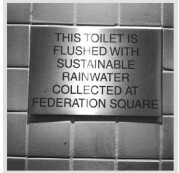 In Australia, for instance, rainwater harvesting is a $500-million industry; 5.1 million residents own a rainwater tank, according to the Rainwater Harvesting Association of Australia. Grant also believes engineers can add value by collaborating with biologists to develop effective and long-lasting biofilters and by collaborating with social scientists and urban planners to determine and help to alleviate the causes of public resistance to LID interventions. The team’s next research effort will do just that. 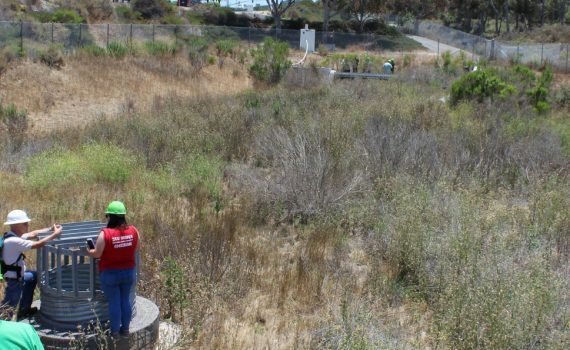 Grant plans to bring together his students and colleagues with the many stakeholders in Orange County, California—consultants, stormwater managers, lawyers, public health officials—to determine the barriers to larger-scale adoption of LID strategies there. “I think it’s going to be a great learning experience for everybody,” Grant says. 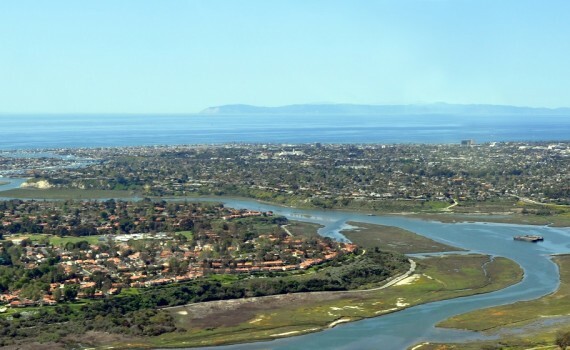 UCI Water PIRE Research on the Impact of Runoff on Receiving Water Quality Gets More Press. A component of UCI Water PIRE’s K-12 outreach program was called out by the White House, in a press release entitled “Lifting America’s Game in Climate Education, Literacy, and Training”. Under President Obama’s Climate Action Plan, important steps have already been taken to cut carbon pollution, prepare for the impacts of climate change, and lead international efforts to fight this global challenge. Continued progress into the future will depend on ensuring a climate-smart citizenry and a next-generation American workforce of city planners, community leaders, engineers, and entrepreneurs who understand the urgent climate-change challenge and are equipped with the knowledge, skills, and training to seek and implement solutions. That’s why today, in support of the Obama Administration’s steady efforts to address climate change, the White House Office of Science & Technology Policy (OSTP) is launching a new Climate Education and Literacy Initiative to help connect American students and citizens with the best-available, science-based information about climate change. The Initiative is kicking off with a roundtable discussion at the White House, convening key leaders in the education community from government, academia, philanthropies, non-governmental organizations, and the private sector to discuss ways to enhance climate education in the United States. The discussion will focus on planned and potential efforts to: increase learning opportunities about climate change for students; equip educators with science-based information and resources; enhance climate-related professional development and training; and engage citizens through place-based and informal climate education. Through the Climate Education and Literacy Initiative, the Obama Administration is asking leaders across sectors to step up and help lift our Nation’s game in climate education. In response to an initial call to action made in October, more than 150 activities, projects, and ideas were submitted by individuals and organizations across the country, from more than 30 states. These included a diverse array of innovative approaches being implemented in K-12 classrooms, on college and university campuses, and in zoos, parks, aquariums, and museums to educate and engage students and citizens of all ages. Today’s launch includes a number of exciting new commitments by Federal agencies and outside groups. University of California, Irvine (UCI). In January 2015, the Global Sustainability Resource Center will host UCI’s first retreat for undergraduate students enrolled in the Global Sustainability Minor – enabling approximately 40 students to build their skills in strategic questioning, community visioning, action planning, and climate communication. The Resource Center will lead a similar training in Spring 2015 with high-school students in the Anza Borrego desert region, and in Summer 2015 with incoming students through UCI’s Summer Institute for Sustainability Leadership. At the grade-school level, UCI’s Water Partnership for International Research and Education H2Outreach, a graduate student-led educational program, will design an interactive activity to turn more than 700 local elementary-school students into water engineers and scientists for a day in Spring 2015, teaching them about environmentally friendly ways to manage water in the face of a changing climate. 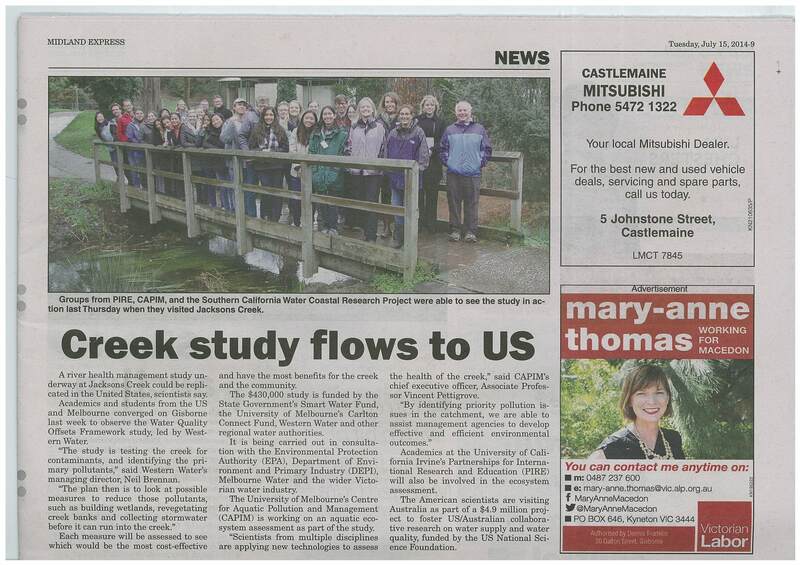 UPP Down Under Group Makes the Newspaper in Australia! Click Here for the Article. Environmental Science and Technology publishes a special issue focused on “Design Options for a More Sustainable Urban Water Environment”, including a feature article on Australia’s Millennium Drought written by the UCI Water PIRE team.